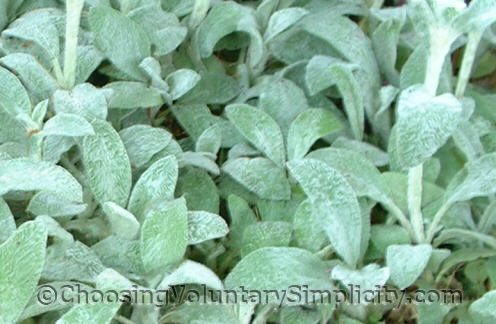 Lamb’s ear (Stachys lanata) has thick and fleshy ornamental foliage, and after it has been growing in the same spot for a couple of years, it has a tendency to die off in the center, leaving an empty area. I think it helps prevent this if you keep the plants trimmed and remove all the old leaves so that moisture does not collect in the denser center areas and rot the plant. Lamb’s ears do not like to have their feet wet, and mine seem to do best in partial shade. I don’t agree that they like to be in full sun, although many garden books say they do. The flowers are tiny and purple, have a fragrance like pineapple, and the bees love them. The plant itself is only about ten to twelve inches tall, but the flower stalks will reach much higher. 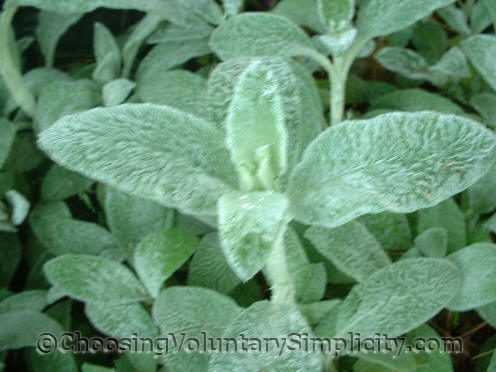 The most attractive characteristic of lamb’s ear is the fuzzy soft leaves that give this plant its name. Lamb’s ear is propagated by division or by the seeds, which will sow themselves if you don’t remove the spent flower heads. People seem to have strong feelings about lamb’s ear… they either love it or hate it. Since this herbaceous perennial originally grew wild in the rocky areas and poor soil of northern Turkey and southern Iran, it can get very much out of control in a garden environment where it is given better growing conditions. Oddly, for me lamb’s ear has proven to be only mildly invasive. I have had it for years and I have found it quite easy to keep it under control… but probably that is because I make sure I cut the flower stalks off before any seeds can form. My mother in law is one of those people you mentioned who has strong feelings about lambs ear. She hates it. I have a real pretty stand of it in my garden and every time she sees it she talks about how much she hates that plant. I don’t see why. It’s a beautiful plant and I’m glad to have it doing so well for me. Thanks for the wonderful information and for the photographs. I enjoy your other garden articles too. The lambs ear I had died over this summer. I feel bad that I moved it because I think I took it out of the sun and put it into too much shade. The plant sort of rotted away. I’m going to start again next summer and put them back where the others were growing. Thanks for the reminder of how attractive this one can be. My little boy always wants to feel the softness of the lamb’s ear leaf. He rubs his little finger against the “fuzzies” and calls it his little lamb. Just thought you’d get a kick out of hearing this. Lindsay, here (zone 4) lamb’s ear always dies down to the ground over winter and comes back in the spring, so yes, I would think if the leaves are damaged you would want to remove them.